The Hazard Mitigation Plan describes our City’s natural and human-made hazards, identifies actions we can take to reduce their effects, and establishes a process for implementing the plan. An approved plan makes San Francisco eligible for federal hazard and flood mitigation grant funding before and after a Presidentially-declared disaster. We’re looking for feedback on both the existing and updated plans, and on how you like to receive information on hazards and preparedness. To review San Francisco’s existing plan visit www.sfdem.org/hmp. Comments on the plan should be sent to dem.communityaffairs@sfgov.org. Comments on the existing plan will be accepted through September 30. A revised Hazard Mitigation Plan will be released for comment in October. SFDEM appreciates your participation! As partners in updating the Hazard Mitigation Plan, we can think through and better prepare for the hazards we face together. DEM’s 2012-2013 Annual Report is Here! As we begin a new fiscal year in San Francisco, we are pleased to share with you our 2012-2013 Annual Report. Don’t let the simple title fool you; DEM has done a lot of cool stuff throughout the last year, so thanks in advance for taking some time to learn about DEM’s key initiatives and accomplishments! This morning DEM’s @sf_emergency tweeted a link promoting a weight loss fruit. 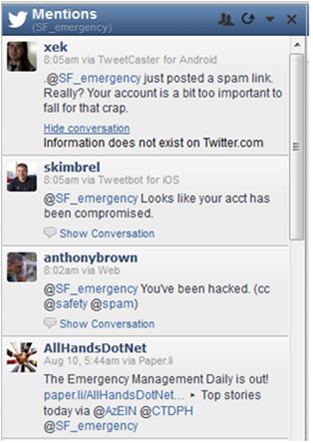 Although we are all for healthy living, @sf_emergency does not share information of this nature nor would it ever. So what happened? The simple answer: we were hacked. A fairly innocuous hack, but none-the-less our social media/cyber security was compromised. And we take this seriously as @sf_emergency is a trusted resource for San Francisco’s emergency notifications, alerts and warnings. Unfortunately, hacking…happens. Case in point: last April the Associated Press experienced a far more serious security breach to their Twitter feed stating there were two explosions at the White House and the President was injured. So, what are we doing about this morning’s hack? We’re taking a good look at our social media security practices, and one most significant (and easy) step we’re undergoing is to bolster our password security. And a special thanks to our followers who noticed this morning’s errant tweet: thank you for speaking up!